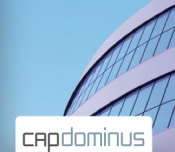 Capdominus is a SaaS for commercial real estate professionals that is a great marketing and deal management platform. Buyers, lenders and equity sources update you with their latest criteria, programs, transactions, and contact info so you remain better informed by a larger network of capital. You can tap this network intelligence to identify the best prospects for any deal and develop the right capital relationships. Then, utilize the latest cloud-based deal management tools to get to market smarter. Currently, the product has a small user base. Existing customers are very pleased and I am eager to acquire more users in our target market.